Please join us for a live podcast recording! To my joy, artists’ books have found a new wonderful home here in Copenhagen at BLADR (meaning to flick). It is a collective run by art book lovers and art professionals and is a space that both exhibits and sells artists’ book. I met with Sara Lubich, one of the founders, who told me that the space had grown out of a communal wish to give the art book a central exhibition platform on its own terms. Artists’ books have previously been present at the periphery of the art institutions in bookshops, but have now been given a room of their own, which is a very welcome addition to the local art scene in Copenhagen. BLADR, Griffenfeldsgade in Nørrebro, Copenhagen. Photo Christian Klintholm. At BLADR they arrange changing exhibitions, talks and projects centered around the artists’ book and everyone passing their location at Griffenfeldsgade 27 in Nørrebro are welcome inside. Artists’ books is an interesting format as it is conceived and produced by the artist and similar to an exhibition in a book format. They often explore a certain aspect of the artists production in-depth, whereas an art book is often written by others than the artists themselves. There is a lot of creativity and experimentation in play in the format, as opposed to the exhibition format that is more costly to make and show. According to Åse Eg from Pist Protta, artists’ books are a European tradition dating back to William Blake's poems that were engraved with artworks dating back to 1789, to Max Ernst’s collage books and later Asger Jorn and Guy Debord’s books from the 1950’ies. The American tradition of artists’ books is thought to begin with Ed Ruscha’s book, Twenty six Gasoline Stations from 1963. The first edition was published in an edition of 400 (later more editions were published) and was the ideal about a democratization of art, due to the development of the offset technique. Printing techniques such as photocopies and silk-screen prints are later experimented with, as the methods are developed and made available to artists. It seems the art book market has exploded recent years. This is due to the printing process becoming more hands on and cheaper for artists to access. Also the rise of the internationalism of the art world has played a role in this, as it is easier to keep in touch through social media and see what others make and get inspired from this. A book is also an easier format to access as it is not limited to a physical space where people have to travel to see a particular show by an artist. One Thousand Books, Rema 1000, Carlsberg, Copenhagen. Photo Johan Rosenmunthe. I was first introduced to the wonderful and experimental universe of the artists’ book in 2013 at One Thousand Books. This was an Art Book Festival that took place for the first time at the Carlsberg area in Copenhagen. 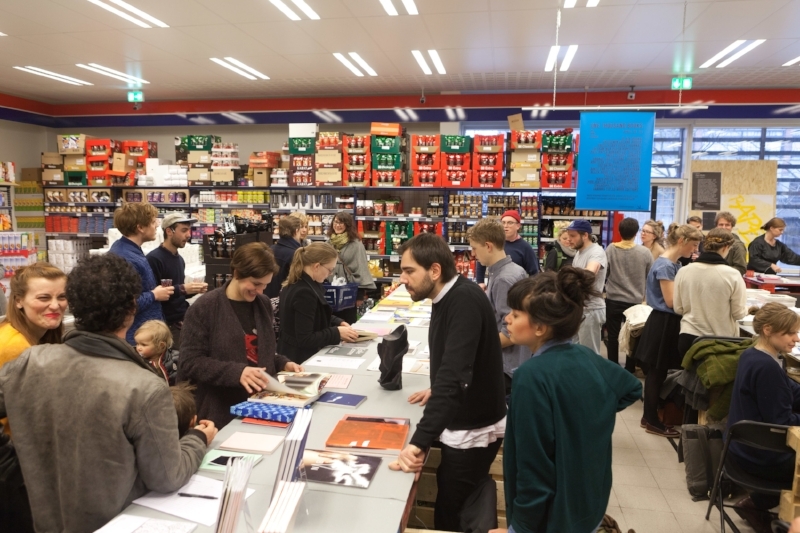 Here independent publishers from Northern Europe met in the local supermarket REMA 1000 and presented and sold their books. The festival was organized by the Copenhagen based publishers Lodret Vandret founded by Johan Rosenmunthe and Flemming Ove Bech. It was a beautiful experience, witnessing the mix of an ordinary supermarket suddenly having a sales section dedicated to artists’ books. At the supermarket the independent publishers introduced their books to the general public and book fans alike. The shoppers were genuinely curious of what the publishers were selling and it was one of the most exciting art related fairs that I have attended, as the setting was so surprising and fresh, introducing artists’ books to a new audience who engaged with curiosity. One of the participating publishers at One Thousand Books was Åse Eg, one of the founding members of Pist Protta, the bi-annual experimental art magazine. The magazine is edited by Jesper Rasmussen, Jesper Fabricius and Åse Eg Jørgensen and published by Space Poetry, run by Jesper Fabricius. Pist Protta has been in existence since 1981, publishing Danish and international artists artworks in their varying concepts for the magazine over the years. Pist Protta was invited to exhibit at New Shelter Plan in 2014, where the entire production of 74 issues (until then) were exhibited. Photo by Johan Rosenmunthe. Pist Protta is known to experiment with everything from the format, paper type, graphics and layout. Each publication is in the cross section between artwork/magazine/artists’ book with a given theme that differs from one to the next, Concepts such as mistakes, atlas, text based art and circles have been explored and expressed. This experimentation with the expression and content, gives each edition of the magazine its own expression and every edition of Pist Protta could therefore be considered a printable and portable art exhibition in it itself. In 2016 the complete history of was exhibited at Charlottenborg in Museum Pist Protta where the editions were presented according to 6 different themes. Photo by Anders Sune Berg. Johan Rosenmunthe confirms my thoughts about the current, and significant, rise in the interest in artists’ books. Since arranging the One Thousand Books festivals in 2013, 2014, 2016 in Copenhagen, Lodret Vandret have been invited to exhibit at art book fairs every week somewhere in the world. Most recently they published a book about Danish artists’ books and held the recent edition of the One Thousand Books at Annual Reportt in Nørrebro where the included books from the publication were presented. Lodret Vandret were recently in Norway on board a cruise ship to present their publications and are participating in a seminar about artists’ books in Helsinki this fall. One Thousand Books at Annual Reportt in Nørrebro, 2018. However, the artists’ book is still a niche within the art world as the general public is not as familiar with this format as they are with other art forms. This is something that BLADR, Lodret Vandret, Pist Protta all actively work with. By bringing artists’ books into peoples homes internationally and locally in Copenhagen, where BLADR now have brought artists’ books out into the broader public for us all to enjoy and support.